One video’s journey across Latin American protest movements underscores the challenge of monitoring activism online. Last Friday, the end of a week in which mass protests in Venezuela resulted in hundreds of arrests and five deaths, a new YouTube video circulated among Venezuelan social media networks showing police officers spraying a water cannon at a young man tied to a tree. The title described in Spanish the GNB—part of Venezuela’s armed forces—torturing a student in Táchira, a state along the Colombian border where clashes have been especially violent. The problem was, the Human Rights Channel had seen this video before. The same footage circulated among Colombian activists early this year. The YouTube description of this version states that the video was uploaded from a mobile phone on December 29, 2013. Colombian media activists reported on the video, describing it as depicting ESMAD, or Colombian special forces, torturing a farmer who participated in the country’s widespread agrarian protests. While it’s unclear who would scrape, re-upload and intentionally misidentify footage of police abuse and with what motivations, it is easier to imagine why so many activists, believing the footage to be true, would share the video among their networks. (On Sunday night, the video was removed by the uploader, after several commenters pointed out that it was scraped from a different context.) After all, the mistreatment of detained activists had been reported on by reputable sources; and considering theattacks on journalists covering the protests, citizen reporting and social media have become critical tools to document and share news of the protests and abuse of authorities. But as Global Voices has reported, both opposition activists and media channels supporting President Nicolás Maduro have engaged in the dissemination of false, decontextualized, or misleading images. 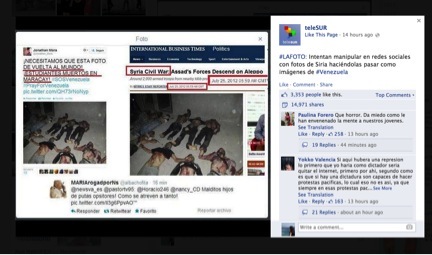 One widely circulated Facebook thread condemned the alleged use of photos from Syria by anti-government protesters in Venezuela. The distribution of false images with hidden agendas not only fuels the political—and increasingly violent—divide, but makes it difficult for those monitoring the movement online to separate fact from fiction. And it places an extra burden on those trying to document the protests honestly. This is why verification is at the core of the Human Rights Channel, which works with our partners at Storyful to make sure that we not only amplify authentic footage of human rights abuse, but put a stop to the spread of misinformation. • Title: Keep it brief and descriptive, including the date and location. • Describe: In the YouTube description, include greater context about the video, such as what happened before, during, and afterwards, and links to more information. • Credit: If the video was originally uploaded by a different user or on a different website, provide a link to the original video. That will help journalists or human rights monitors verify that the footage is authentic. For those monitoring the protests online, and curating images documenting abuse, the Verification Handbook is a free online resource with tools and tips to determine the authenticity of online media. For a downloadable Spanish tip sheet on how to verify online video, click here. Witness is an international nonprofit that, for the past 20 years, has used the power of video and storytelling to generate awareness of human rights abuses and empower human rights defenders to fight injustice. You can subscribe to the Human Rights Channel on YouTube and follow Witness on Twitter for the latest on citizen video of human rights abuse.